Neil Armstrong. The first man on the moon. 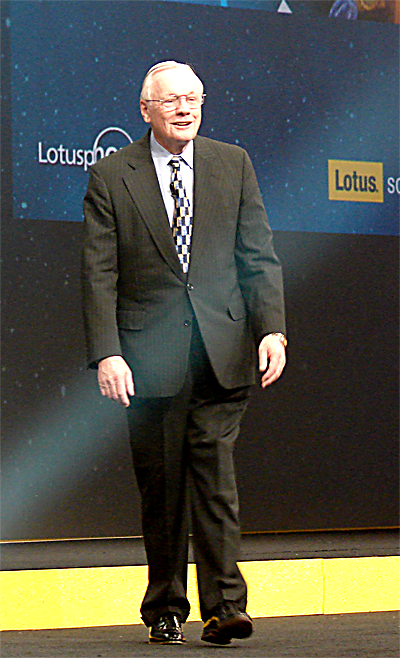 Speaker at Lotusphere 2007 (where I took the picture above). Self-proclaimed geek. I always loved reading about space growing up, and I read everything from sci-fi to real stories. One of my favorites was Carrying the Fire: An Astronauts Journey by Michael Collins (the third Apollo 11 astronaut), which I read in Swedish translation (as I was just 7 or 8 years old at the time). The scientists came up with an experiment to measure the distance from Earth to the moon, using a laser. But in order to do that, they needed a mirror placed on the lunar surface. I was the service technician tasked to put the mirror there. Best speaker ever, and with Lotusphere being renamed to Connect, he will keep that title forever.